Microsoft has finally hit the list of top five PC makers in the United States for the first time. Gartner, the market research firm revealed today that 4.1 percent of the U.S. PC market is now held by Microsoft, leaving Acer for the fifth spot. What landed Microsoft in the top five are its Surface devices, and with the unveiling of the Surface Pro 6, things are expected to get better. The latest lineup features better internal specifications and the top-end model is actually cheaper than the predecessor’s top-end version while providing more powerful hardware in return. Microsoft has managed to have a top position in the United States but the company has still a long way to go before that position is reflected worldwide. Acer and ASUS both are competing for the fifth spot worldwide while Lenovo is in the lead across the globe. 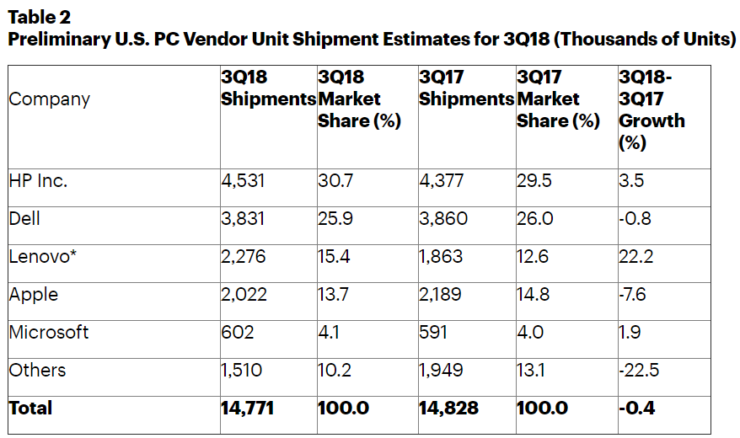 Gartner and IDC both agreed to the fact that Lenovo is indeed the top PC maker but both of these research companies have provided different estimates for shipments. Gartner claims that the PC shipments have increased by 0.1 percent in Q3 2018 while IDC says they have declined by 0.9 percent. These differences in estimates provided by both research firms exist due to their different ways of counting PCs. For example, IDC’s data includes Chromebooks and does not count Windows Tablets and devices with a detachable keyboard like the Surface Pro. Gartner, on the other hand, counts the Windows-based tablets as PCs and excludes Chromebooks or any non-Windows based tablets. 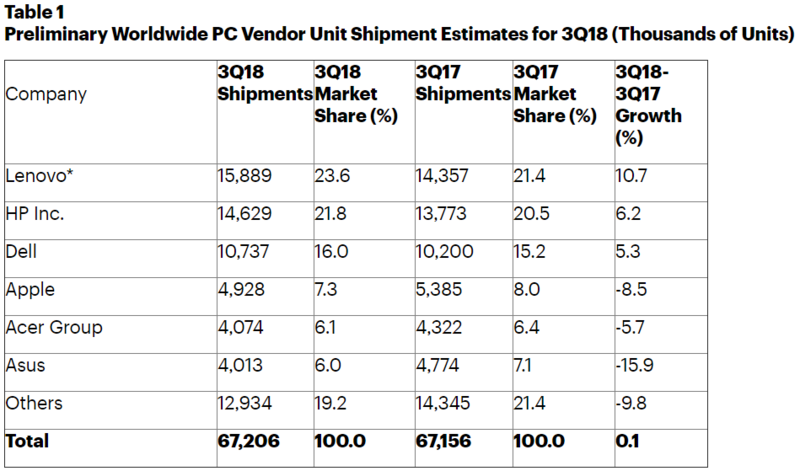 The PC market, despite its decline for six years seems to be leveling itself out and could grow more in 2018. An increase in consolidation towards the top runners of this market like HP, Dell, Lenovo and recently joining the party – Acer, Apple, and ASUS can be observed as they all lose share of the market to others. Microsoft is taking a small portion of the market share in the U.S. as they are seeking to broaden their reach and appeal through their Surface devices which includes a new Surface Pro 6, Surface Laptop 2, Surface Studio 2 and Surface Headphones. Microsoft’s market share figures appear just weeks before the company is due to report its Q1 2019 financial earnings. To remind you, the company’s Surface segment revenue soared from 25 percent to $1.1 billion in the most recent quarter, making Surface a billion dollar business. Hopefully, it will be able to do better when the software giant announces its latest financial results.